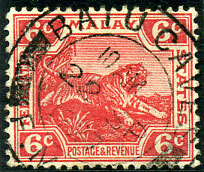 dated 28 SE 1936 on 25c piece. 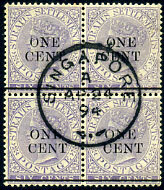 APL 27 1899 on QV 4c on 8c (SG.108)piece. 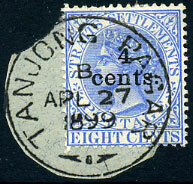 on 1894 3c (SG.23) piece. 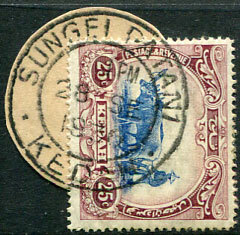 (D3) in purple dated 26 NOV 1909 on pair F.M.S. 1c (SG.29). Handbook records only one date of 25 NOV 1909 thought to be this example (due weak day slugs). 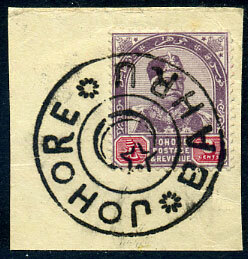 Right stamp with crease. Ex NAYLOR (1983). 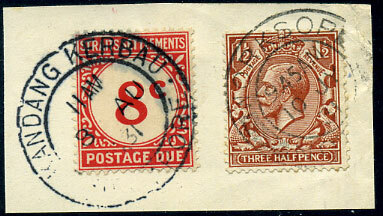 (D5) 22 SP 1927 on 6c (SG.64).